Choosing minibus insurance can be difficult as you will generally need a policy which is tailored for your own individual business. There are many factors that come into play as many owners will generally be using their own vehicles, for a variety of reasons, depending on the business. A Minibus will usually need a policy that includes medical and collision options depending on their limits and excess amounts. It’s always advisable to make sure you have adequate Minibus Insurance to cover losses to you personally, your passengers as well as your vehicle. A minibus fleet would provide an annual comprehensive or third party fire and theft cover for any line of business or group who own anywhere between 2 – 12 vehicles. All our Quotes are tailor made to get you the best cover. Call now for a customised one minute quote. Like all fleet policies, there is an option for you to have an open driver policy; this is beneficial as it allows drivers to switch between vehicles hassle free. Imagine you are a headmaster/headmistress at a school and you have several minibuses to take the kids to and from activities. It is a lot easier to have an open policy rather than calling your insurers every time to add a driver on. 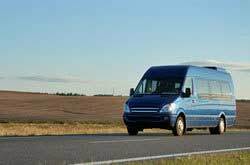 Breakdown cover is essential for minibus owners as no one wants to be stranded roadside with several passengers. Here at Goldcrest insurance we offer Breakdown cover as an extension but with some insurers breakdown cover is already included. Goldcrest Insurance will explore the market and tailor a quote specifically designed for your business. I can therefore confidently recommend Goldcrest Insurance to anyone that wants good affordable insurance with great customer service.